Stories detailing the efforts of the Paddlers Hemlock Health Action Taskforce, or P.H.H.A.T., have been featured in the media lately. Eugene Buchanan of the paddling news website Paddling Life and Derek Lacey of the Hendersonville Times-News both wrote stories highlighting the hard work of a group of kayakers who are helping chemically protect hard to access trees in the Green River Gorge. 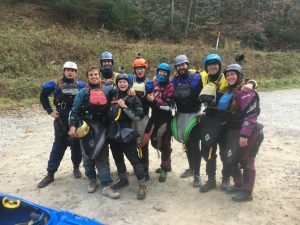 This collaboration between the Hemlock Restoration Initiative, American Whitewater, the North Carolina Wildlife Resources Commission, and MountainTrue, utilizes expert paddlers to treat trees along the Green River. By following a custom protocol to ensure safety and protect water quality, this group has enabled us to chemically protect many trees that can be accessed from the river and would likely not be otherwise treated due to the difficulty of accessing them by land. Buchanan’s story can be found on the Paddling Life website, and Lacey’s story can be found on the Hendersonville Times-News website. We at HRI extend a huge thank you to both authors for bringing attention to this hardworking group of volunteers and their important effort. See paddlersforhemlocks.com to learn more about the P.H.H.A.T. Green River project.